An Akron, Ohio mother still has major hurdles following early release from jail on a 10-day sentence and conviction on charges she tampered with records to get her daughters in a better school and a safer environment. Kelley Williams-Bolar, a resident of Akron public housing, used her father's address in the Copley-Fairlawn School District so her two daughters could attend school there. Williams-Bolar is a teacher's assistant in Akron, and was enrolled in college studying to become a teacher. During her four-day trial earlier this month, she said she wanted her children to be in a safe environment. Now, her residential status with the public housing authority is in question. Also, her conviction on felony charges means she would need approval to work with public school children, said Akron City Council President Marco Sommerville, who has been working to assist the family. "We're hoping to work it all out. We're asking how you can kick someone out of public housing whose children were not allowed to continue school in another area because they didn't live there?" Sommerville told BlackAmericaweb.com. "It may be that they'll want to adjust her rent if the children don't live with her," he said. Also, Sommerville and other community leaders have been speaking to school officials on Williams-Bolar's behalf. "Hopefully, she will get to keep her job," he said. Williams-Bolar was convicted on Jan. 15 by a 12-member jury that included five blacks, according to community leaders familiar with the case. She was ordered to report to the Summit County Jail on Jan. 18, in a city that has seen its share of crime in recent weeks. Shortly after 10 p.m. on Jan. 17, just hours before Williams-Bolar was sent to jail, two gunmen walked into an area storefront casino, robbed it, and shot an employee in the head, according to sheriff department reports. In another development, a petition was launched Wednesday on the social action site Change.org, calling for Ohio Gov. John Kasich to pardon Williams-Bolar. In less than two days, more than 55,000 people have signed the online petition, and it keeps growing, said Patrick Schmitt, Change.org director of global campaigns. "Our members are very passionate about this issue. 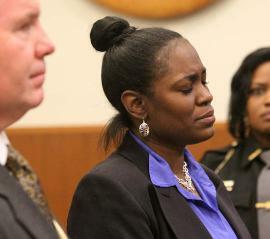 It resonates because here we have a mother trying to get what is best for her children and getting sent to jail for it," Schmitt told BlackAmericaWeb.com. "This petition already is among the top five for us, ever," Schmitt said. "It will stay up until Governor Kasich takes action, and we're hoping that will only be a couple of days." Each time someone signs the petition, an email goes to the governor, "so he already has received more than 50,000 emails," Schmitt said.